SciNet, Canada’s largest supercomputer, provides researchers with the resources necessary to perform their research at massive scale. To ensure high ROI, the supercomputer needs to meet high levels of availability. One method of doing so is by using a burst buffer for checkpointing—however, checkpoints must be completed within 15 minutes to meet availability SLAs. 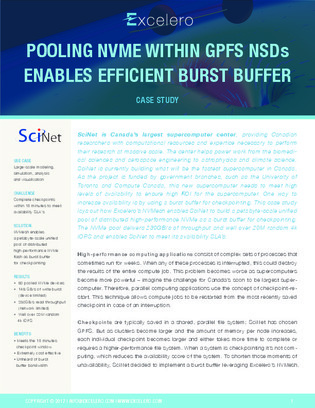 This case study illustrates how SciNet’s SLAs are met by using a unified pool of distributed high-performance NVMe as a burst buffer for checkpointing, delivering 230GB/s of throughput and over 20M random 4k IOPS. Read on for the solution highlighted within, which enables customers to build high-performance burst buffers without needing additional proprietary arrays.